Fix & Perm / Cell Fixation and Permeabilization Kit ab185917 is used to improve the staining of intracellular markers for flow cytometry. It is used to fix cells in suspension and then to permeabilize the cell membranes. It can be used for both cytoplasmic, mitochondrial and nuclear markers, as well as markers in other cellular organelles. The reagents allow antibodies access to intracellular structures and leave the morphological scatter characteristics of cells intact. The formulation reduces background staining and allows the simultaneous addition of the permeabilization medium and fluorochrome labeled antibodies. The overwhelming majority of flow cytometry antibodies are suitable for use with this kit (a limited number are sensitive to the fixation step). Store at room temperature. Please refer to protocols. Our Abpromise guarantee covers the use of ab185917 in the following tested applications. 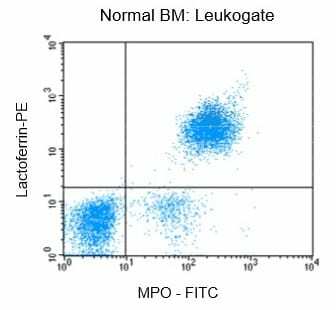 Flow cytometric analysis of normal bone marrow (BM) after fixation and pemeabilization using Fix and Perm kit ab185917, followed by immunostaining for the intra-cellular antigens Lactoferrin and MPO. ab185917 has not yet been referenced specifically in any publications. Publishing research using ab185917? Please let us know so that we can cite the reference in this datasheet. There are currently no Customer reviews or Questions for ab185917.